Installs on any Smooth Surface in Seconds! Light-up your UTV or GolF Cart with TubeLoom, the new alternative to using LED's that don't stay stuck, or a chore to mount. TubreLoom is an American designed and manufactured product that comes pre-made with large 50/50 LED's installed and ready to install. You can apply Tubeloom to almost any clean and dry surface, and it's there for as long as you want it. 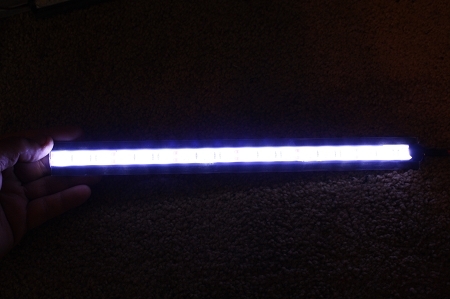 These quality LEDs are encased inside the TubeLoom channel which is only 1" in width, and less than 1/" in height. The TubeLoom housing uses (2) industrial strength doubled sided adhesive tape strips, (included). The strip comes pre-wired with 12" of 18-2 gauge wire ( on one end), and you can choose to have the other end wired ready to connect to other pieces for a small up charge, (see options) You can add multiple strips to a single controller to create an outstanding light display. TubeLoom LED's come in two versions (see options), one for flat surfaces, and the second for round tubing, which enables you limitless areas of application. TubeLoom LED's draw very little current, and multiple strips can be added and connected in parallel (red to red / black to black), and not have to worry about battery draw-down.